A tour of Pricketts Fort is a "must do" for visitors. Family-friendly, live, dramatic tours help visitors understand the essence of 18th century life inside the fort. 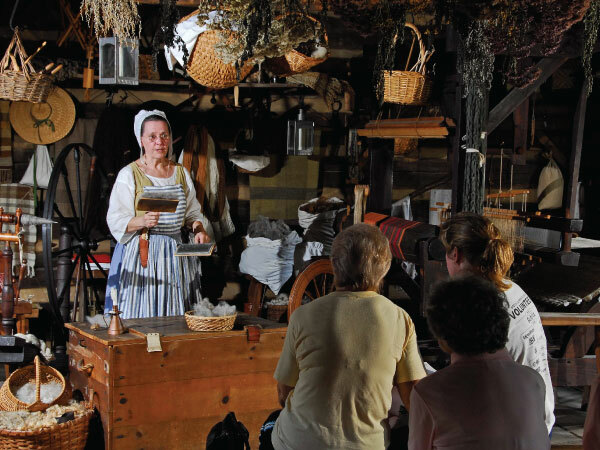 Costumed interpreters share stories while practicing tradesmen demonstrate blacksmithing, weaving, hearth cooking, gunsmithing and more. The tours include historic buildings, gardens, the grounds and many things of interest to children and adults. Individual and group tours are available. Cost of admission covers all of the park's historical attractions including guided tours, specialized talks, orientation gallery, and craft demonstrations. The 2019 season begins April 22nd and ends October 27th. Pricketts Fort gift shop, orientation gallery and administrative offices are open year-round, Monday through Friday, 10 a.m. to 4 p.m.
Pricketts Fort offers an audio tour during the off-season from November through March. The cost is $4 per person and tickets can be purchased from 10am to 3pm in the Pricketts Fort Visitor Center. I have been to Williamsburg, Henricus Park in Richmond, and other sites like yours. I really enjoyed your knowledgeable staff, and that I could freely wander and get up close to your exhibits. The attention to detail and hands-on nature of Pricketts Fort make it stand out. I will be back."